Today was Day #3 of Chocolate and Quinoa Theme Week. Quinoa comes from South America (Peru, Bolivia, Ecuador, etc. 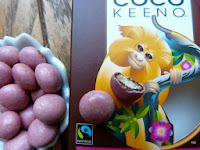 ), from many of the same countries where cacao originated. Quinoa, the edible seeds of a vegetable-like plant, rather than a grain/grass, has been cultivated on the slopes of the Andes mountains for many centuries, and has become popular as an alternative to grains for those looking for gluten-free and kosher options. Cacao grows in temperate, rainforested areas of the same countries. Together, these crops have helped raise the incomes of indigenous farmers and farm co-ops in these regions. 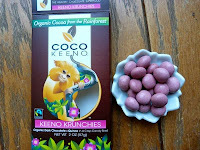 Each of today's Keeno Krunchies from Wonder Food Co. (Palm Desert, CA) had a bittersweet core made of 70% organic dark chocolate-coated crunchy rice and quinoa; and this center was covered with a crispy candy shell (dyed naturally with a hint of beet juice). Today's Keeno Krunchies are part of the company's Coco Keeno line that incorporates organic cacao from the rainforest. 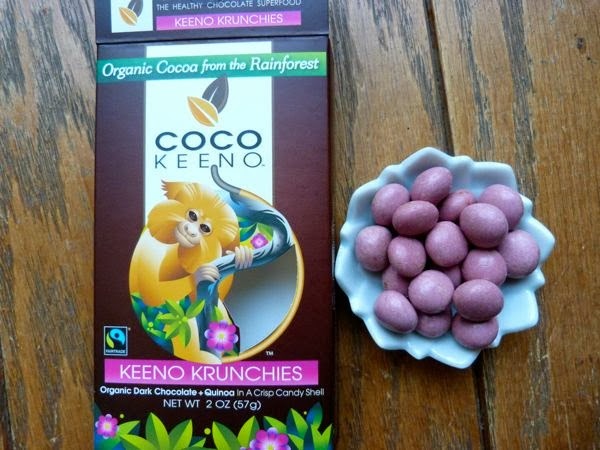 The company designed their Coco Keeno line of treats to provide a healthier, preservative free, energy boost alternative to candy bars and other processed snacks. Labels: chocolate and health, chocolate and quinoa, Wonder Food Co.